We understand your frustration when it comes to having a leak in your swimming pool, after all we deal with clients week in week out who have your problem. Your major concerns are probably the risk of any further damage to your pool & surrounding property along with the ever rising cost of topping up your pool! 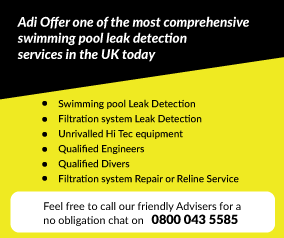 Here at ADI we are proud to offer the most complete pool leak detection and repair service on the market. Our specialist team are able to pinpoint with extreme precision the exact location of a leak on most pools, within a single working day. Our team are not only PADI certified scuba divers, but are also experts in leak detection as we have been detecting leaks since 2012 – giving you complete confidence that you’re making the right choice when you hire ADI Leak Detection. Our expert engineers use a unique combination of equipment including specialist microphones, tracer gases, thermal imaging and specialist pool leak detection devices that we have developed here at ADI. 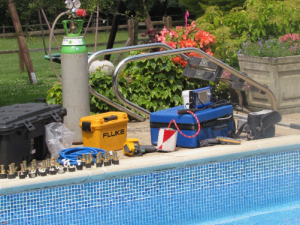 Our engineers are able to locate leaks that have baffled others for years, using our unique tool set and expertise we are able to locale leaks on all sizes of pools in domestic and commercial situations – indoor and outdoor. We help pool owners, just like yourself to locate leaks without incurring expensive costs of experimental exposing of buried pipework or pool structure. Not to mention the time taken and costs involved in any remedial works required from just digging. 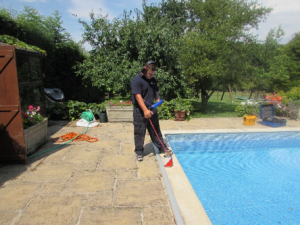 On the day that we come to locate your leak in your pool you will be the only job of the day for your team – giving you complete confidence in the service that we are providing you with – no mistakes because the engineers need to be rushing off to another job! Just total dedication your your pool! So we can carry out an investigation of the highest quality, we only use the highest standard of equipment. Don’t delay! Call us today on 0800 043 5585 and let us find that leak before it does any further damage to your property.